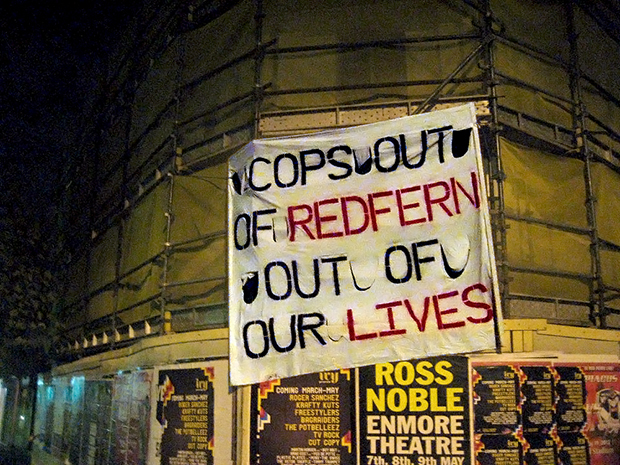 On April 1, some Sydney anarchists disrupted a police PR exercise with a timely reminder of the death of TJ Hickey and the over-policing (which is to say, policing) of Redfern’s aboriginal residents. 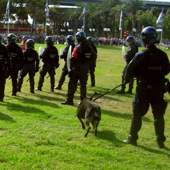 As soon as we arrived, we began handing out hundreds of anti-police fliers to passers-by, in which we outlined the repressive role these pigs have played over the past 150 years (and the previous 70 through earlier manifestations) as the armed defenders of early colonial and now corporate elites. We also raided numerous police stalls and took all their propaganda, from police recruitment pamphlets (some directly targeting Kooris), to “Cops are Tops” stickers, to police fridge magnets and temporary tattoos, even puzzles for children featuring ‘Constable Charlie’ the penguin. The strangest of all was a leaflet for contest to “WIN A DAY WITH THE NSW POLICE FORCE”, a ‘prize’ that many would prefer to avoid.